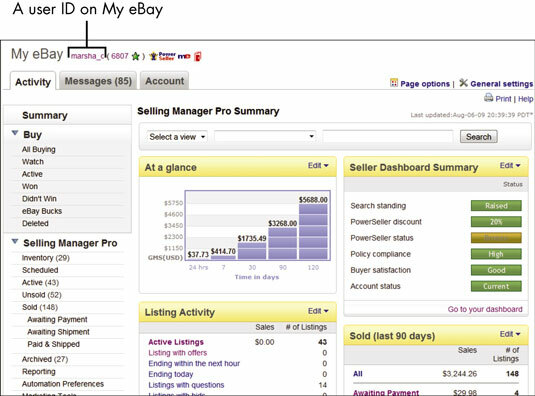 Your eBay user ID is how other eBay users will know you, so think long and hard before choosing one. You can call yourself just about anything, but the eBay user ID you choose shows up on all listings, bids, and personal pages. If you’ve never liked your real name or never had a nickname, your eBay user ID is your chance to correct that situation. Choose an ID that tells a little about you. Of course, if your interests change, you may regret choosing a user ID that’s too narrow. You can change your user ID once every 30 days, but remember that people come to know you by your user ID. If you change your ID, your past does play tagalong and attaches itself to the new ID. But if you change your user ID too many times, people may think you’re trying to hide something. Don’t use a name that would embarrass your mother. Likewise, eBay tells you to avoid user IDs that are offensive (such as &*#@guy). Don’t use a name with a negative connotation, such as scam-guy. If people don’t trust you, they won’t buy from you. Don’t use a name that’s too weird, such as baby-vampire-penguin. People may chuckle, but they may also question your sanity. Don’t begin your user ID with an e followed by numbers, an underscore, a hyphen, a period, or dot (as in dot.com). Don’t use names consisting of one letter (such as Q from Star Trek). eBay doesn’t allow spaces in user IDs, so make sure that the ID makes sense when putting two or more words together. A friend of mine intended to register as “gang of one.” She forgot the hyphens, so her ID reads gangofone. eBay also doesn’t allow certain special characters, including & (even if you do have both looks&brains), @ (such as @Aboy), the greater than or less than symbols (> <), and consecutive underscores (__). Your ID can reflect your name too, or a nom de plume (if you’re highly security minded). In these days of transparency, a buyer may feel more comfortable buying from Steves-plumbing than from PlumbingGuy. Whatever you choose as your user ID can become your brand. Once you get to selling in earnest, you can promote your brand (or name, if that’s your ID) on social networking sites, such as Facebook.